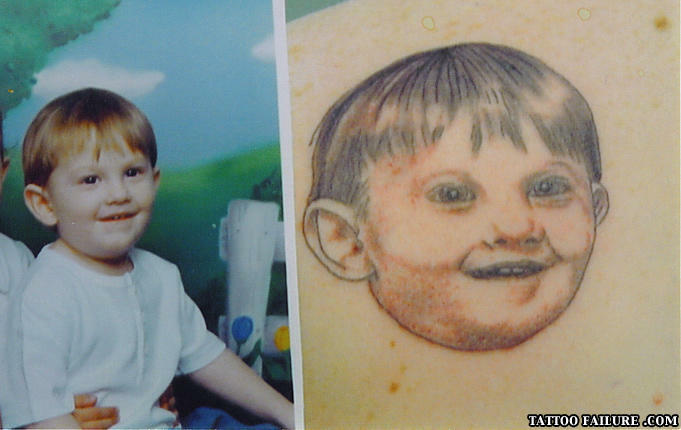 Actually, the tattoo looks a lot like the picture...Its the kid that fails. This tattoo says "my son is ugly." DUMB and DUMBER the early years! i dont think its very funny to take the piss out of it when its probably a memorial tattoo to remember his son! If you pull the guy's skin downwards with a couple of hooks, the tat will be a spitting image of the kid. how is there not a goonies/sloth-as-a-kid reference on here yet with ears like that? The kid in the picture looks fine, however the tattoo artist apparently gave the kid Down's Syndrome... Poor Kid. Oops, forgot to lock the aspect ratio! My bad! What do you get if you cross a Sheep with a Kangeroo.